Jacqueline DeLeon with the Native American Rights Fund testifies on voting rights before a Washington legislative committee Jan. 23, 2019. A bill in the Washington Senate seeks to improve voting rights for Native Americans. The Native American Voting Rights Act is sponsored by John McCoy, the only tribal member in the state Senate. 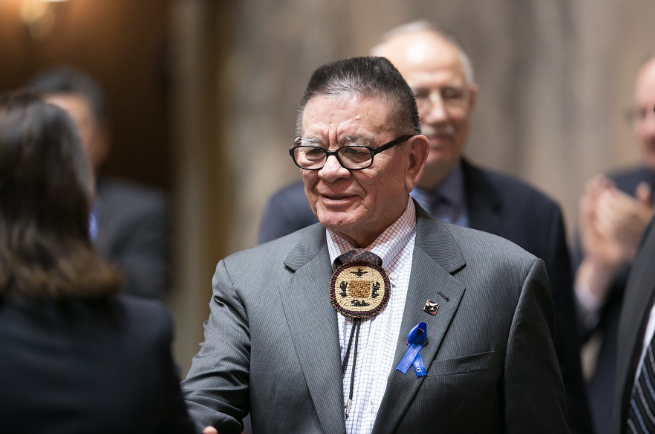 Washington state Sen. John McCoy, D-Tulalip, is sponsoring the Native American Voting Rights Act. McCoy, a Democrat from Tulalip, says voting needs to be easier for tribal members. The proposed bill would allow tribal members to use their tribal ID cards for voter registration, and they would be able to use non-traditional residential addresses in that process. Tribes could also request the governor designate state facilities on reservations for voter registration. It also addresses ballot pickup and return procedures on reservations. A companion bill in the state House has been proposed by Rep. Debra Lekanoff, a Democrat and tribal member whose district includes Bellingham and the San Juan Islands. During the Senate committee hearing, Jacqueline DeLeon presented findings from a study by the Native American Rights Fund. DeLeon, an Attorney with NARF, told the State Government, Tribal Relations and Elections Committee there are a number of barriers to voting rights for Native Americans. “I don’t think it comes as any surprise to anybody that Native Americans largely live in remote areas,” she said. Isolation was one among a long list of what DeLeon deemed barriers that keep Native Americans from voting. DeLeon also made recommendations to lawmakers. According to the National Congress of American Indians, turnout for registered Native American voters ranges from 5 to 14 percentage points lower compared to any other racial and ethnic group in the U.S.